We’d love your help. Let us know what’s wrong with this preview of Killing Floor by Ai. 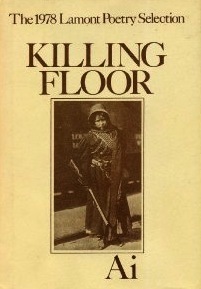 To ask other readers questions about Killing Floor, please sign up. If loving the poetry of Ai is wrong, I don't want to be right. Fierce, dark, imaginative, frightening, kinetic poems. The poet is not afraid of intensity. I read this in an edition that included Ai's book, "Cruelty." Once, in a poetry class I was teaching, I asked my students to pick a poet/poem from our textbook to write a close reading on, and to briefly explain why they picked what they picked. I had one student choose a poem by Ai and explain that it was because "I really love love poems." I always found that interesting (and testament to how poorly I taught that particular class), and it's always what I think of when I first see Ai's name-- and wonder if that student ever k Dark, intense, and memorable. Ai makes me feel like I am losing my mind whenever I read her. Her persona poems are absolutely the best. They are so realistic and varied, it feels like past lives may be a real thing. I read her other book Cruelty, and I liked it slightly better but everything I've read by her has been fantastic. Most of the poems take place in the past, and in a lot of different locations. There is a lot of violence in them. The violence is very realistic. I had to put the book down a couple times. These poems Ai makes me feel like I am losing my mind whenever I read her. Her persona poems are absolutely the best. They are so realistic and varied, it feels like past lives may be a real thing. Most of the poems take place in the past, and in a lot of different locations. There is a lot of violence in them. The violence is very realistic. I had to put the book down a couple times. These poems are some of the heaviest I've read. A lot of poems in this collection are sectioned and the titles are usually a time and place, or a type of person or job title, so you know right away what persona is the speaker. The line breaks are in orderly spots, natural breath spots in the poem. I like the ideas behind this collection more than I liked the poems themselves.